Chateau Marquis de Terme is another Bordeaux wine estate with a long history. The original owner was Bernard de Faverolles. In 1661, September 7, he sold it to Pierre des Mesures de Rauzan. At the time, this was one of the largest properties in Bordeaux. In fact, this Medoc estate was so big, it gave birth to four different Classified growths; Rauzan-Segla, Rauzan-Gassies, Chateau Desmirail and Marquis de Terme! Like many properties in Bordeaux owned by wealthy families at the time, it was originally created through a marriage dowry. It was a gift to celebrate the marriage of Mademoiselle Rauzan du Ribail to Jean Desmirail which helped create a dowry gift for the marriage between Elizabeth de Ledoulx d’Emplet and the Marquis de Termes, François de Peguilhan de Larboust. That wedding gave birth the estates name after the Marquis de Termes took control of the vineyard. Chateau Marquis de Terme was already well known by the 1700’s and counted Thomas Jefferson, America’s third President as one of their fans. This is known due to notes from the diary of Thomas Jefferson. In 1886, Chateau Marquis de Terme was purchased by Frederic Eschenhauer, a very popular Bordeaux wine negociant. The Eschenhauer family managed the chateau until it was acquired by Jean Feuillerat in 1898. Pierre Seneclauze bought the property in 1935. Today, Chateau Marquis de Terme is owned and managed by Pierre’s sons, Jean Seneclauze, Philippe Seneclauze and Pierre-Louis Seneclauze. In 2009, a complete renovation and modernization was finished for all the technical wine making facilities at Chateau Marquis de Terme. In 2018 the Chateau opened a restaurant headed by chef Nicolas Lascombes. The 40 hectare, Left Bank vineyard of Chateau Marquis de Terme is planted to 60% Cabernet Sauvignon, 33% Merlot and 7% Petit Verdot. This shows a slight change since the mid 1990’s with less Cabernet Sauvignon and more Merlot planted today. The Cabernet Franc has also been removed from the vineyard. The terroir is gravel, sand, limestone and clay soils. On average, the vines are 30 years of age. The vines are planted to a density of 10,000 vines per hectare. Their best parcels of vines are located close to the chateau, not far from Rauzan Segla. They also have parcels in Cantenac and a bit further south, next to Chateau dIssan. Starting with the 2013 vintage, Chateau Marquis de Terme began experimenting with organic farming on a small parcel of vines. They are now farming their vineyards using only, 100% organic vineyard management techniques, and were certified organic in 2017. To produce the wine of Chateau Marquis de Terme, vinification takes place in large, cement vats that vary in size from 80 hectoliters all the way up to 250 hectoliters. Malolactic fermentation takes place in tank. The wine of Chateau Marquis de Terme is aged in a combination of 33% to 50% new, French oak barrels and a small amount of 600 liter, Nomblot, concrete, egg shaped vats for an average of 18 months. The Nomblot eggs, which are used for an average of 8% of their production, first became popular due to their usage in the Rhone Valley by Michel Chapoutier. 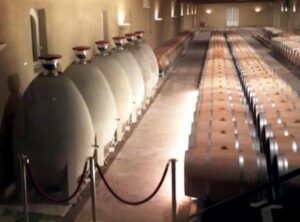 The egg shaped, concrete vats are said to add more minerality to the wine. Additional experiments are taking place with the portion of the wine aged in the egg shaped vats by exposing the wine to a nano oxygenation technique that introduces tiny amounts of Nitrogen, Oxygen and Carbon Dioxide into the wine. 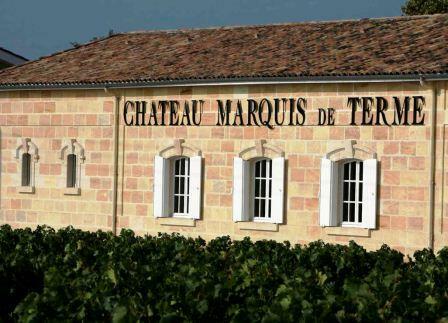 On average, Chateau Marquis de Terme produces close to 12,500 cases of Margaux wine per year. There is a second wine. Prior to 2008, the second wine was sold as Les Gondats de Marquis de Term. In 2008, the name for the second wine was changed to La Couronne de Marquis de Terme. The owners also produce wine in the Rhone Valley in the Bandol and Cotes de Provence appellations. The Best Vintages of Chateau Marquis de Terme are: 2018, 2017, 2016, 2015, 2014, 2012, 2010, 2009 and 2005. Approach older vintages with extreme caution as they are not at the level the vineyard is capable of producing. Today Marquis de Terme is making the best wines in the history of the estate! So far, the 2015 is the best wine they have ever produced! Chateau Marquis de Terme can be enjoyed on the young side with decanting. But you are better off giving the wine some time to develop. Young vintages can be decanted for an average of 1-3 hours, give or take. This allows the wine to soften and open its perfume. Older vintages might need very little decanting, just enough to remove the sediment. Chateau Marquis de Terme is usually better with at least 7-9 years of bottle age. Of course that can vary slightly, depending on the vintage character. Chateau Marquis de Terme offers its best drinking and should reach peak maturity between 10-18 years of age after the vintage. Chateau Marquis de Terme is best served at 15.5 degrees Celsius, 60 degrees Fahrenheit. The cool, almost cellar temperature gives the wine more freshness and lift. Chateau Marquis de Terme is best served with all types of classic meat dishes, veal, pork, beef, lamb, duck, game, roast chicken, roasted, braised and grilled dishes. Chateau Marquis de Terme is a perfect match with Asian dishes, hearty fish courses like tuna, mushrooms and pasta as well as cheese. Deeply colored with a nose that focuses on fresh red fruits, licorice, espresso and bitter chocolate, the wine is medium bodied, bright and almost crisp on the palate. There is fruit, sweetness and a lot of lift. Showing better from the bottle than it did in barrel, the wine has filled out and softened, adding floral nuances to the licorice, cherry, black raspberry and smoky overtones. Soft, polished, round and with fruit to spare, this is showing great today and will only get better wine time. Deep in color, flowers, black raspberries, licorice and smoke are easy to find. Lush, silky, fresh and polished, this is quite a nice style of wine. Dark ruby in color, there is a real depth of flavor here, due to all the layers of lushly textured, soft, polished, ripe, sweet, black and red fruits. The wine is silky, concentrated, velvety textured and energetic. This will age quite well. With intensity of flavor, the dark, perfectly ripe, sweet, black and deep fruits offer a concentrated, velvety textured, mouthful of wine. There is length, richness, complexity, energy and the ability to age and evolve for at least 3 decades, or longer. This is another Margaux that is a contender for the best wine ever produced at the estate. A fabulous wine in every sense of the word, the wine is silky, plush and with a solid intensity of flavor, finish with silky tannins and freshness. Clearly the best wine ever from Marquis de Terme. Medium bodied, finesse styled wine with a fresh, cherry component, toasty oak and sweet, but light, fruits in the finish. From a blend of 55% Cabernet Sauvignon, 40% Merlot and 5% Petit Verdot, the medium bodied wine displays a floral, black cherry, espresso and earthy soft, Soft and easy to drink, this should drink well young. Smoky, with licorice, black raspberries and note of cocoa in the nose, the wine is soft, forward, medium bodied and ready to drink almost on release. .
With a floral, dark red berry, espresso and thyme scented nose to start things off, the medium/full bodied wine keeps going, with its polished tannins, freshness and core of ripe dark cherries and cassis. Still young, give it 5-7 more years to develop. Coffee bean, earth, black raspberry and spicy plum aromas create the aromatics. Suave and round in texture, the round wine, from an assemblage of 60% Cabernet Sauvignon 34% Merlot and 6% Petit Verdot, finishes with a long, fresh, ripe, concentrated layer of dark cherries. You can see some lightening in the color that is correct for its age. Tobacco, cedar, thyme, herbs and red berries are delivered via the medium bodied, crisp, classically styled, wine. Medium bodied, tannic and with a lean to the bright side of the style range, the nose is best part of the experience with its earthy, floral, red berry and tobacco character. Future vintages are much better at this estate. From a blend of 65% Cabernet Sauvignon, 30% Merlot and 5% Petit Verdot, cassis, tobacco, earth and leafy scents poke through. Medium bodied with some dryness in the tannins, give it a few more years. There is some tartness in the red and black fruit finish. Bright red fruits, freshness, medium bodied and soft textured, the wine is more interesting on the nose than the palate. Charming, fully mature, mid-weight, easy drinking charmer, with perhaps more interest on the nose, than the soft, but light palate. Fully mature, medium bodied, earthy, tobacco infused wine, with bright red fruits and cigar box notes. The wine offers soft textures and a light, fresh, earthy, red berry and leafy sensation in the finish. This is not a wine for long term aging.